Sports are known to connect people. We all know someone who is passionate about one sport or an other. We believe engagement shoots are there to represent who you are as a couple and what you enjoy doing together. 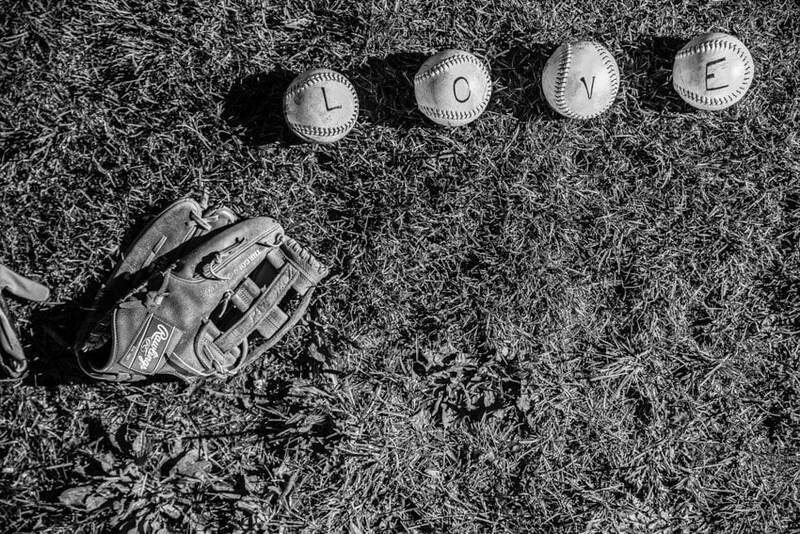 Sports themed engagement photographs are great for save the dates and let you show off your fun side. 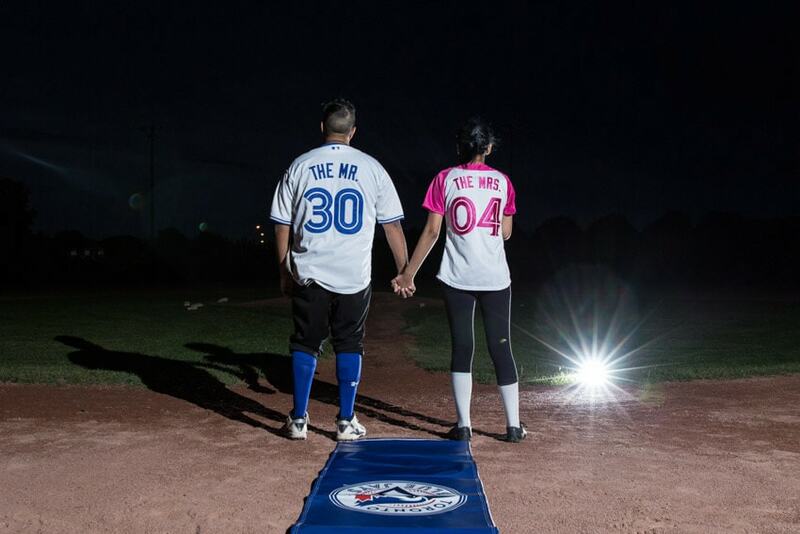 So, if sports are your thing, check out these couples for ideas on how to show your sports spirit! 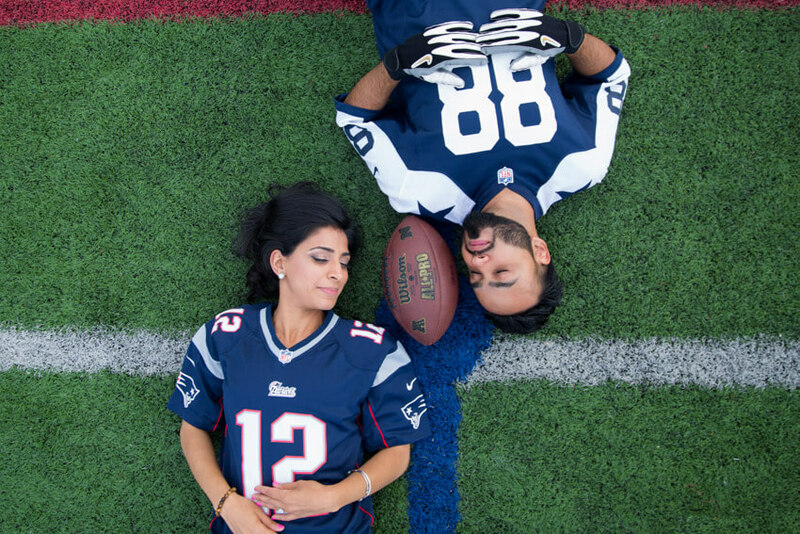 Here are some of the sports themed engagement shoots! First up, we have our true Blue Jays fans: Mahesh and Mitali. The baseball diamond during the night time created a wonderful air of romance and and intimacy without losing sight of their baseball theme. For this shoot, Mahesh and Mitali printed their wedding date on their jerseys; a simple, creative and effective way to make their save the dates! A sport loved far and wide, all you need is a soccer ball and an open field – you are all set! 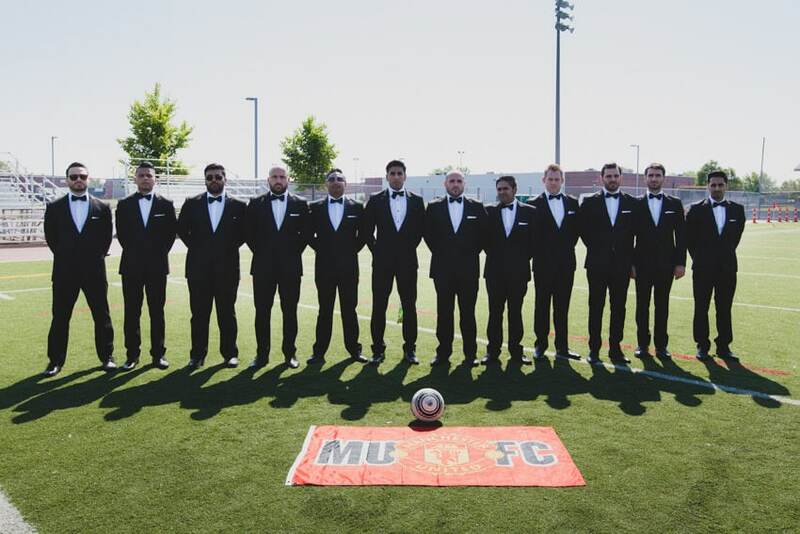 Devinder and Harneet love soccer, so for save the date we took their wedding party to a nearby field and captured some fun moments – a great way to really show off their personality and relationship. To add more flavor to your photographs you can have the bride and groom wear their favorite team jerseys or work around their favorite team flags. Canadians sure love their hockey, and Shupy and Baldeep are no exception! 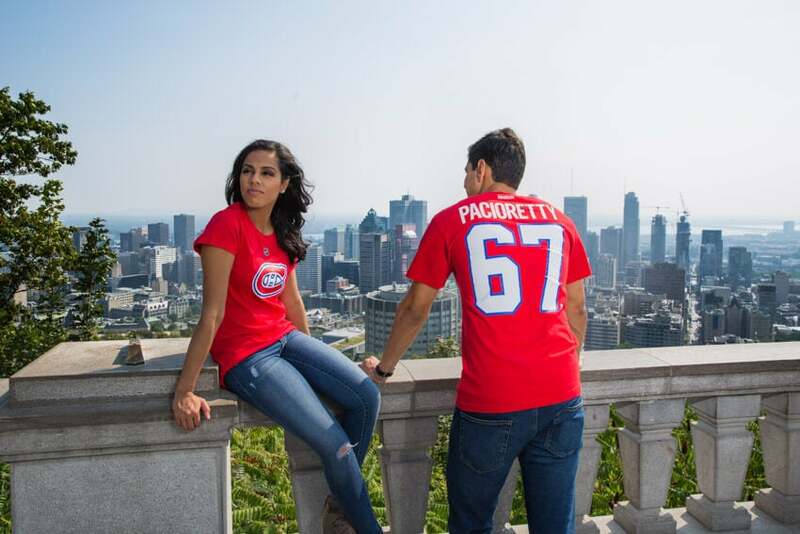 Donned in their favourite jerseys, these two show off what it means to be a true fan of the Montreal Canadiens! It is not necessary to go all out, you can always tone it as per the comfort level of the couple so as to keep it fun and romantic at the same time. As for this couple, they didn’t get on the rink yet the photographs convey the idea. Share some love on the football field. You know what they say about cute couples and football–they go together! For one of our clients who isn’t a big fan of getting photographed but enjoys basketball, we booked a basketball court. In no time we had the groom in his comfort zone getting photographed. You can incorporate various ideas depending upon sports you like and what makes you unique as a couple. Lifestyle shoots are a good way to get that candid look and showcase what you enjoy as a couple and your personality as one. To diversify your engagement shoot, we recommend couples to sign up for the complete engagement package.